﻿ My Product Key Does Not Work | Why doesn't my Product Key work? My Product Key Does Not Work! Why doesn't my Product Key work? Instantly find your Product Key with Product Key Explorer! Product Key Explorer - Quickly Find over 4000 popular software product keys from your local machine or network computers, including Windows Product Key and Microsoft Office product key! If you Orderingd your PC with Windows already installed from a large manufacturer such as Dell or HP, it's likely that Windows was installed using an OEM key instead of the actual key for your PC. This saves them money because it's much more efficient for these large companies to install Windows once and then clone the drive. 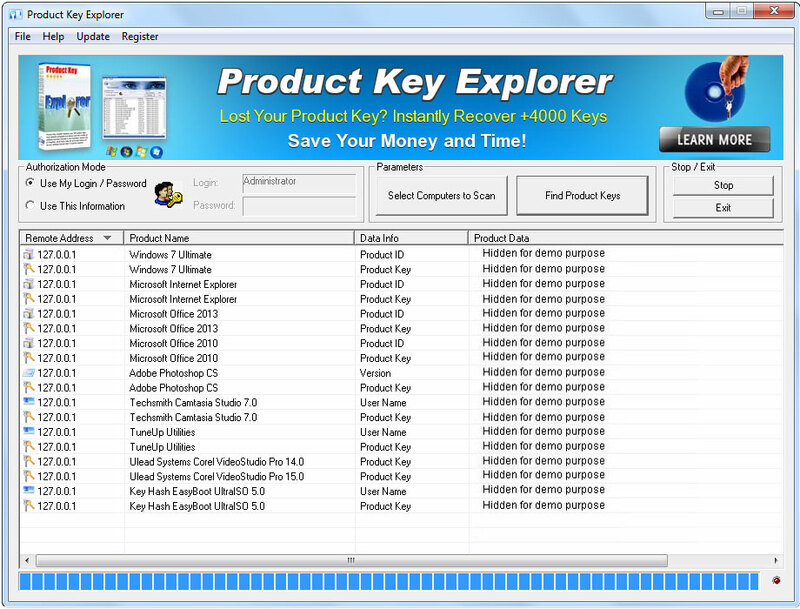 Product Key Explorer quickly recovers and displays product key, including Windows 7 keys, Windows Vista key, Windows XP product key, Microsoft Office 7 product key, MS office 2010 key, Adobe Photoshop, Adobe CS5, CS4, CS3, Norton product key, Electronic Arts games and more than +4000 popular software products installed in your local machine or in network computers. With this Key Finder software you will be able to track the number of software licenses installed in your business, find and recover a lost or forgotten product keys, save and keep an up-to-date backup of all your software license keys in a central location. Excellent tool for network administrators, or businesses undergoing a software license compliancy. You can save Product Keys as Tab Delimited Txt File (.txt), Excel Workbook (.xls), CSV Comma Delimited (.csv), Access Database (.mdb), SQLLite3 Database, Web Page (.html) or XML Data (.xml) file, Print or Copy to Clipboard. With Product Key Explorer 1 user license you can scan all computers in your company without limits. 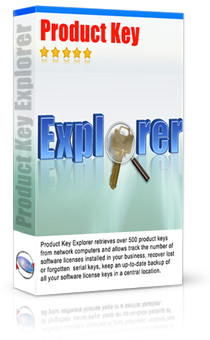 Product Key Explorer is the easiest to use toolkit on the market. Join our Volume Licensing Program and achieve substantial savings on Orderings of 5 or more Software licenses.